Temperance is a 5 reel, 20 payline video slot from Old Skool Studios that has been produced in co-operation with Microgaming. Playable from 20p to £20 a spin on desktop, mobile and tablet devices, you are taken to an underwater city where you make picks in a 5-stage feature to win prizes. There’s also a Free Spins feature where up to 40 free spins can be won with multipliers up to 10x – this volatile title offers nearly 5,000 times your bet on each free spin! The setting is a once great underwater city which was built to protect society from temptation – enough of the backstory, it has a steampunk feel with symbols on the reels including hearts, diamonds, clubs and spades. You will also see radios, bottles, diver helmets and sonar devices. The male character is the wild and substitutes all symbols bar the bonus and scatter symbols – it also pays 50 times your stake for 5 on a payline. Furthermore, you will hear the iconic La Mer song from Charles Trenet playing as you spin the reels! 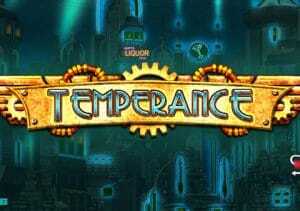 Overall, Temperance looks and sounds fantastic. When it comes to bonus features, there are 2. The Survival Bonus feature is played when the bonus symbol lands simultaneously on reels 1, 3 and 5 – you enter underwater tunnels where you make picks. With cash prizes on offer, you can find advances to move onto the next level where even bigger rewards can be won. With 5 levels to get through, you will play until you find collect. Temperance is all about the Free Spins feature which is played when you get 3, 4 or 5 free spins scatters – this will give you 2, 10 and 25 times your bet as well as 8, 12 and 20 free spins respectively. Now, the feature includes more stacked wild symbols which will boost your winning potential. Now, you spin a wheel prior to the free spins beginning to determine whether you’ll play with a 2x, 3x, 5x or 10x multiplier. Hopefully you’ll get a 10x multiplier on every free spin! Finally, 3, 4 or 5 scatters during a free spin will retrigger the feature giving you up to 40 free spins potentially. Visually superb, Temperance ticks all the boxes – when it comes to bonus features, they are quite simple but the potential 10x multiplier on every free spin can lead to wins of 4,900 times your bet – on every free spin! This medium to high variance video slot is therefore one to come back to. If you like the steampunk feel, Cazino Zeppelin from Yggdrasil Gaming should be right up your street.